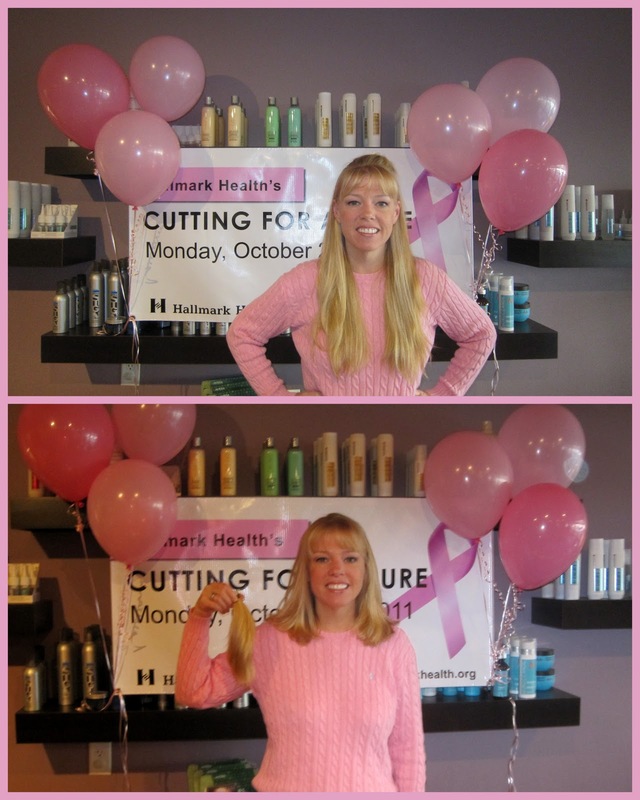 So most of you have heard by now that I donated 8 inches of my hair to Pink Heart Funds on Monday. I wanted to tell you a little more about the big event and of course show you a ton of pictures. So this all started over the summer. My hair was pretty long and I really wanted to cut it but I figured I should grow it a bit longer so that I could donate it. I figured if I was going to donate it I should do something special. I threw out the idea to some girls at work who quickly agreed to donate their hair too and out of that grew this event. I quickly got approval from my boss to organize "Hallmark Health's Cutting For A Cure." A coworker referred me to a local salon that had been open for several months, Halo Studio. Jenn the owner immediately agreed to be involved (and I can't say enough great things about her and the other stylists). 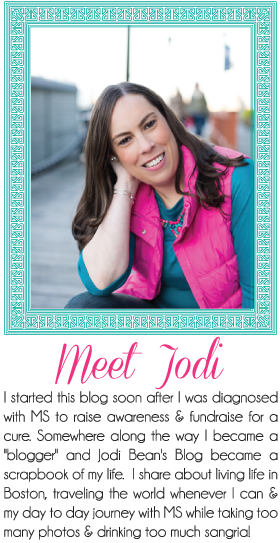 I picked a date in October for two reasons - first I needed a few more months for my hair to grow and second - I thought it would be a great thing to do in honor of Breast Cancer Awareness Month. 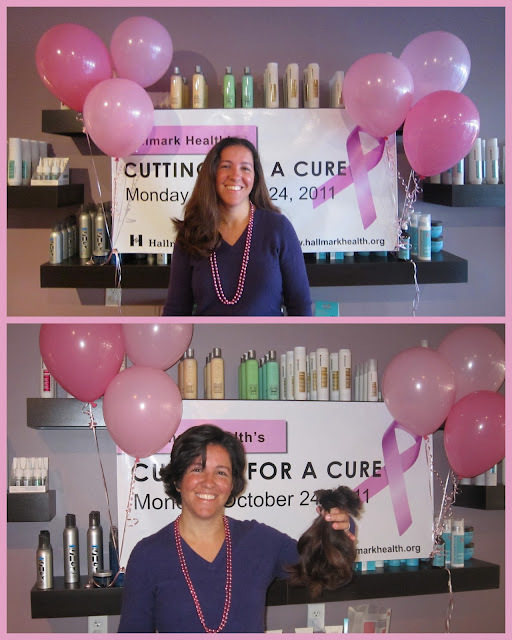 I chose Pink Heart Funds after hearing about it from my blog friend Rachel who donated her hair to them too. I figured that everyone knows about Locks of Love so why not give some attention to a lesser know but still awesome charity! All summer I worked hard to recruit people to participate. There were several announcements in local newspapers and flyers were posted around the hospital. This banner hung in Halo Studio window for several weeks leading up to the event too! 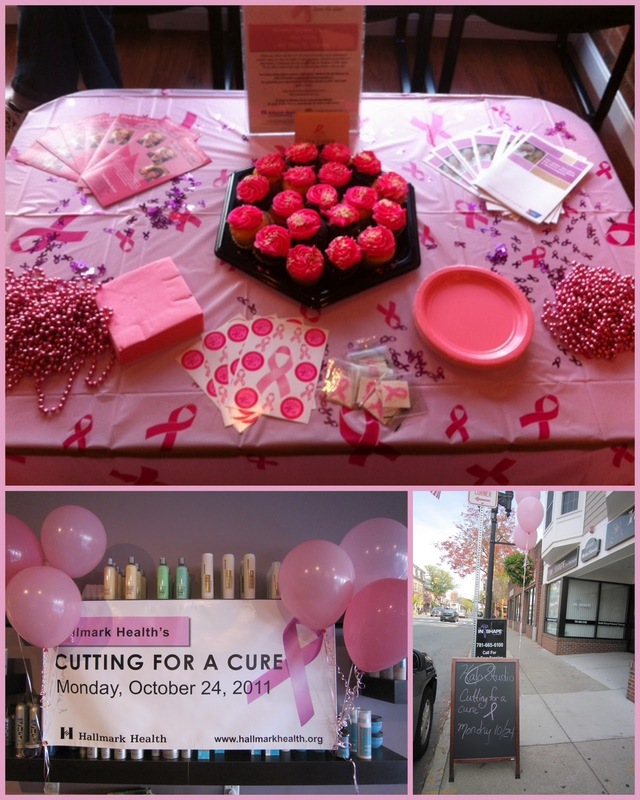 The day of the event we decorated the salon in lots of pink! We even had some sweet treats to enjoy! On my way into work Monday morning I was feeling a little nervous but excited at the same time. Every day on my drive into work I listen to Matty in the Morning on Kiss 108. They do a segment called "Right Now" each day where people call in to say what they are doing. I figured I would call in to share about the event and I got on! I was the last called of the segment and Matt said, "Let's end this on a positive note with Jodi." He told me he donated his hair once and it never grew back! Ha! He also recommended that I cut my hair short enough to spike and bleach it with hydrogen peroxide. I got in a plug for the hospital and the event! It is amazing just how many people listen to that show b/c SO many people told me they heard me. Such fun. Anyways above are my "before" and "after" shots both front and back. What do you think? Here is "the process." Jenn did a great job cutting my hair! 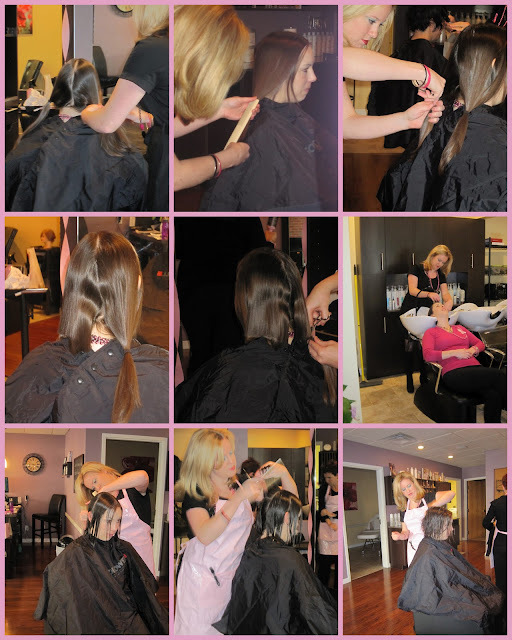 It was fun for me to look at these pics afterwards and see the process of donating my hair. I love my new "do" and my hair feels so healthy and bouncy. I've had short hair in the past so it doesn't feel too shocking to have it this short. It feels very natural to me which is nice. I still can't stop touching it and playing with it! I'm constantly flipping it and trying to see how I want to part it. It is so much quicker to blow dry which I love the most. One of the best parts of donating my hair was being able to do it with so many other amazing women all there for different reasons. I recruited my good friend Joana to donate her hair which she was more than happy to do. It was fun watching her get her hair cut and I love her new style. 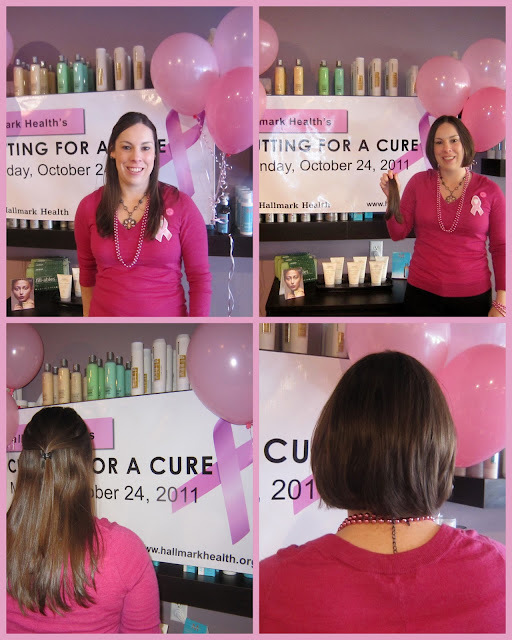 Kathie, one of my coworkers, was the first to agree to donate her hair when I posed the question in the ICU one day. "As long as it is after my high school reunion," she said. Done! As you can see Kathie has very long hair and was feeling pretty nervous once she committed but as you can also see. . . she looks marvelous! Lucky her left for a trip to Ireland the next day so nobody at work has even seen her new style yet! 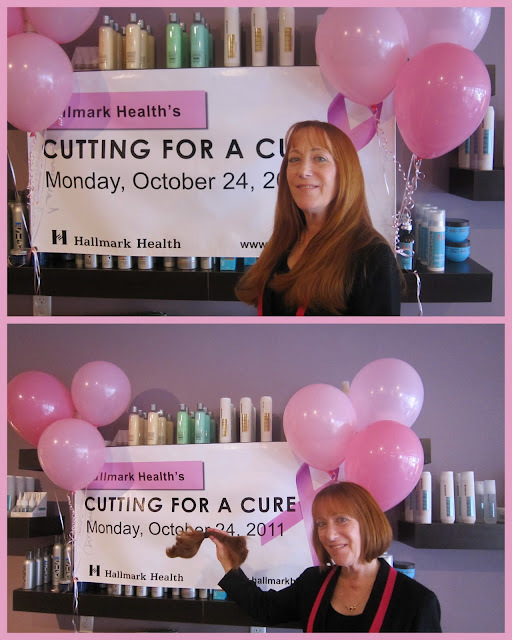 Another coworker, Sharon, was very excited to participate in this event. As a cancer survivor herself she had personal reasons for donating her hair. I love her short hair and things it looks great on her! So many amazing women all donating their hair for different reasons but all wanting to help someone else. . . 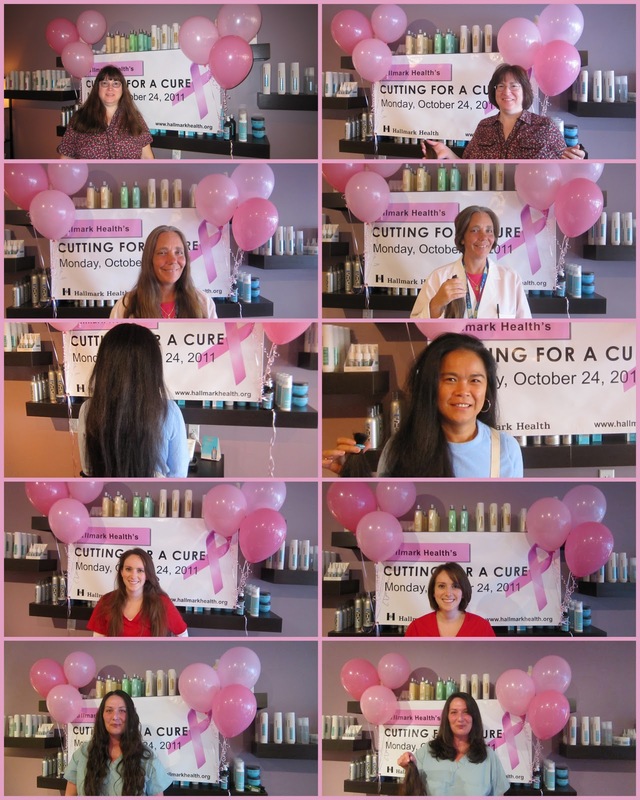 I feel very proud that I was able to influence so many people to donate their hair by organizing this event. In total we will be sending 20 ponytails to Pink Heart Funds which is INCREDIBLE!!! The women who work at the salon are also amazing. Not only did they donate their time and cut our hair for free but they refused to accept tips! They did this out of the goodness of their hearts and b/c they wanted to make us look beautiful so that we could help other people feel beautiful w/ new wigs. Pretty cool that we could all contribute in different ways. And just because Carter is the cutest little boy covered in pink. 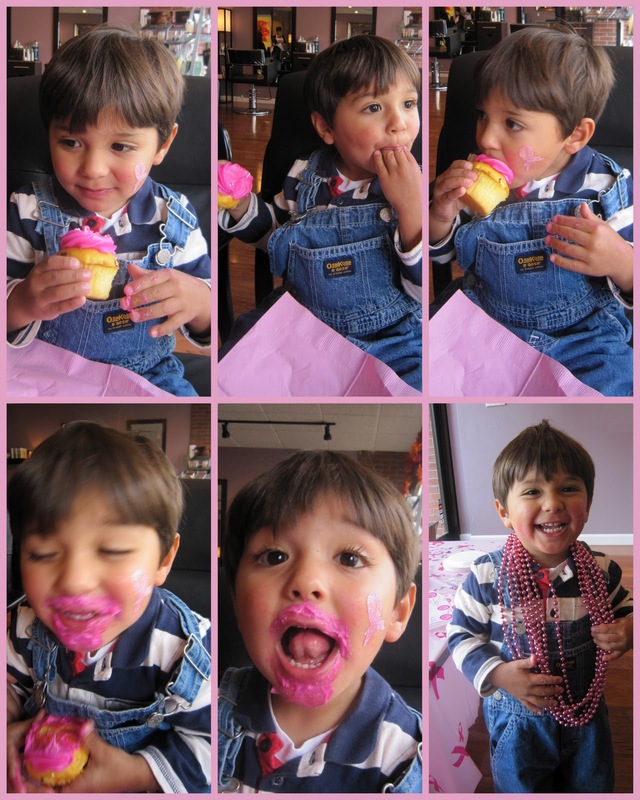 . . let's just say he enjoyed the cupcake and the beads! Love him (for those who don't know he is Joana's son and my little buddy)! 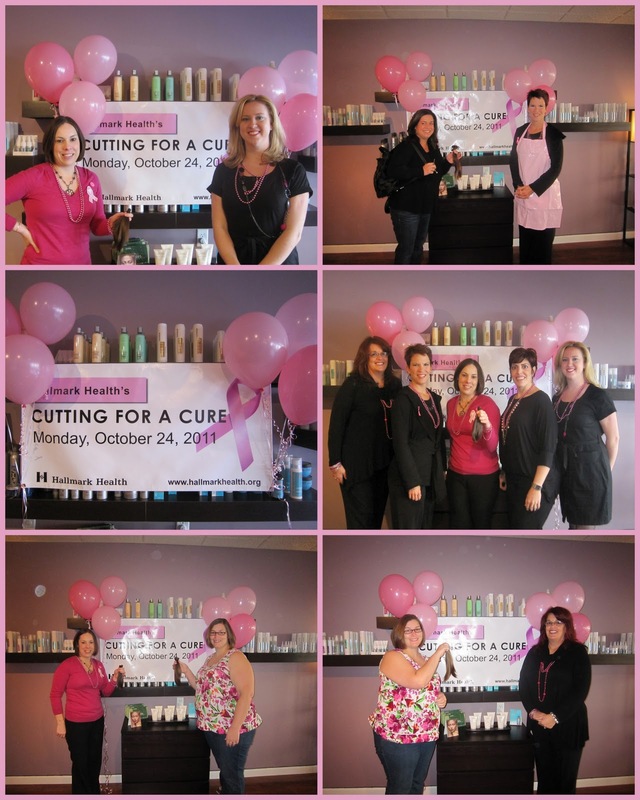 Jenn, the owner of Halo Studio and I have already talked about doing this event next October. I can't guarantee that my hair will be long enough to donate again but I will definitely organize and participate in others ways. We hope we'll have twice as many people! Check out the article in the Melrose Free Press. It was on the FRONT page today! I already have 3 copies! Your hair looks GREAT!!! I LOVE that you chose to donate to PHF! They are a great organization. Have you liked them on Facebook?